Sara Johnston, HCC – SouthShore’s student activities coordinator, left foreground, Emily Hreha, 19, and her sister Adrienne, 17, volunteered to help the South Shore United Methodist Church ministry Backpacks on a Mission during this year’s MLK Day of Service. While many of their peers enjoyed a long holiday weekend getting away from responsibility, two sisters spent theirs helping others. 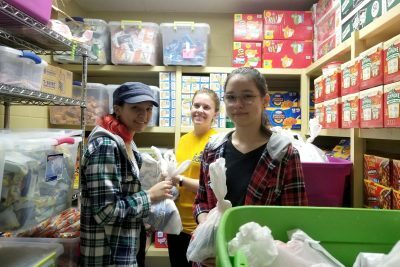 Emily Hreha and sister Adrienne signed up for the Hillsborough Community College – SouthShore (HCC – SouthShore) campus’ annual Martin Luther King Day of Service, which benefits local school-age children in need. It supports Backpacks on a Mission and involves working with volunteers from the South Shore United Methodist Church to collect healthy nonperishables from Sam’s Club in Riverview, take them to the church, stock its food pantry, and then bag specified items in grocery-sized plastic bags to be placed inside children’s backpacks. The backpacks go to students from low-income families at Corr, Summerfield Crossings and Summerfield elementary schools. The kids take them home over the weekend so they will have something healthy to eat. South Shore United Methodist Church normally funds this entire process on its own every week throughout the school year with church donations and occasional community grants. As a part of Hillsborough Community College’s Martin Luther King (MLK) day of Service efforts, which are funded through a state appropriation, additional support is given to the church for Backpacks on a Mission. The 19-year-old, first-year HCC – SouthShore student noted she and Adrienne, 17, were very excited about getting involved. “We felt good about making a contribution, and we’d both like to do it again,” she said. 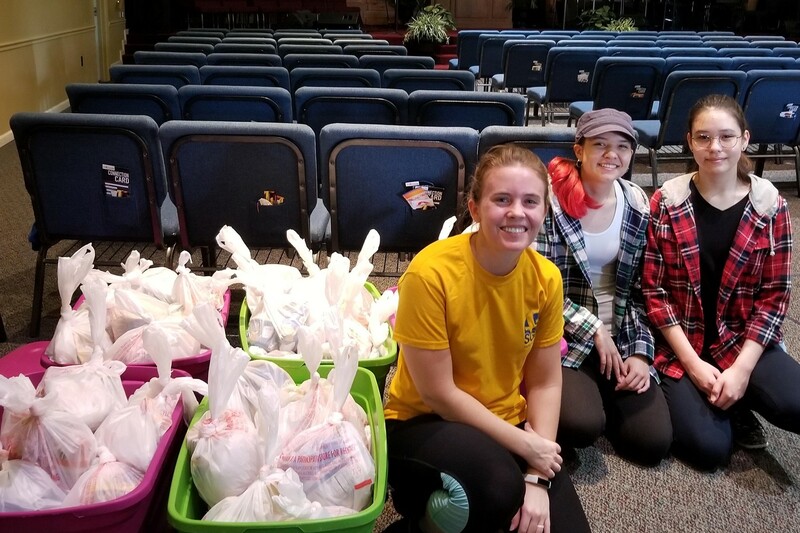 Sara Johnston, HCC – SouthShore’s student activities coordinator, said her campus has helped Backpacks on a Mission as an MLK Day of Service project for the past five years. Emily Hreha, Sara Johnston and Adrienne Hreha are shown in the South Shore United Methodist Church food pantry, after helping to stock it for Backpacks on a Mission during the recent MLK Day of Service. Backpacks on a Mission, a ministry of South Shore United Methodist Church, is coordinated by Riverview resident Connie Bishop. It was started in 2012 and has been ongoing since. 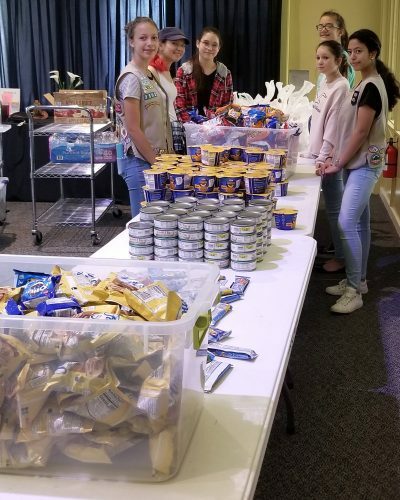 Teams of church volunteers handle purchasing of nonperishable, healthy foods, setting them by school and student, tagging backpacks and color coding them for allergies. Other teams pack the backpacks, take them to the schools, where school counselors distribute them to the children. Currently, about 100 students from low-income families are on the program. “Our kids who participate look forward to their backpacks,” said Dee Ramsey, a school counselor at Summerfield Crossings Elementary School. “These students are on free- or reduced-fee lunches and their parents receive food stamps, so there definitely is a need. Members of a local Girl Scout troop help sort food from Sam’s Club purchased through a special grant procured by the HCC – SouthShore campus for the recent MLK Day of Service. In conjunction with the MLK Day of Service, South Shore United Methodist Church hosted an essay contest for all third-graders at the three elementary schools participating in Backpacks on a Mission. Four-hundred-thirty students researched the history and legacy of Martin Luther King Jr., and each class picked its best two. Fourteen finalists read their essays at assembly in their respective schools, and a group of judges selected the top three from each. Centre State Bank supplied gift card for all of the winners, and every finalists received a copy of Martin’s Big Words: The Life of Dr. Martin Luther King Jr., by Doreen Rappaport. “The (message) of Dr. Martin Luther King Jr. was about justice and equally for all people,” said the Rev. Cory Britt, South Shore United Methodist Church pastor. “Backpacks on a Mission involves people who have and are willing to share. It’s not a handout. We see it as an opportunity for people in need to catch a break. To volunteer or donate to Backpacks on a Mission, call South Shore United Methodist Church at 813-677-9482 or stop by 11525 Big Bend Road, Riverview, any weekday.